Prince William hilarious nudged his wife, Kate Middleton, while at the Royal Air Force celebration this week. [post_ads]While walking towards the Buckingham Palace balcony, Prince William was seen urging Middleton to move to her left to give way to the other members of the royal family. A video of the encounter was shared online via Instagram, and it shows Prince William nudging Middleton to the side at least three times. The Duchess of Cambridge, who is still on maternity leave, was one of the first members of the royal family to walk on the balcony. She stopped for a few seconds to see what’s going on below the palace, and Prince William asked her to continue walking. Middleton immediately followed her husband’s instruction, but she didn’t move fast enough so Prince William once again asked her to step to her left. 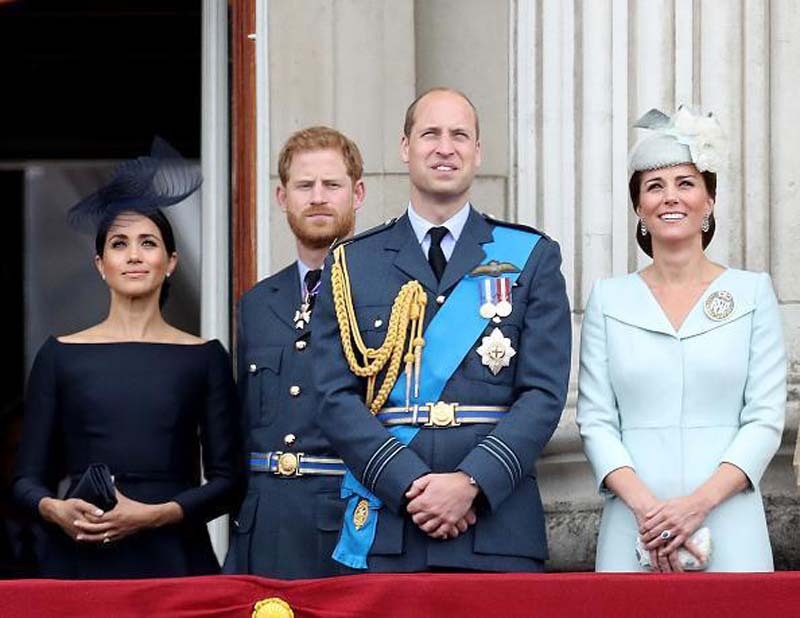 When she finally stopped walking, Prince William realized that Prince Harry and Meghan Markle also needed space at the balcony so he once again gestured at Middleton. Middleton just gave birth to Prince Louis on April 23, and she is still on maternity leave. So, the fact that she decided to attend the RAF celebration deserves some credit. The Duchess of Cambridge reportedly attended the gathering even though she wasn’t required to do so because she was named as Honorary Air Commandant by the Royal Air Force in 2015. She took over the role from Prince Philip. Prior to the RAF celebration, Middleton was seen in public at Prince Louis’ christening on Monday. She was joined by Prince William, Prince Harry, Markle, Prince George, and Princess Charlotte to the ceremony that was held at the Chapel Royal. Justin Welby, the Archbishop of Canterbury, officiated Prince Louis’ christening. Middleton also attended the Trooping the Colour in June.